The MegaWays multiple win game engine doesn’t hold back. Developed at Big Time Gaming, MegaWays is capable of generating 117,649 ways to win. Now licensed to multiple developers, MegaWays is being integrated with past favourites and new casino games alike to create slots with unrivalled payout power. This time around, we go old school with the fruit machine classic Mystery Reels from Red Tiger Gaming. Anyone for fruit? With MegaWays, the Mystery Reels slot really is anyone’s guess. If you’re a fan of new online slots that use old fruit machine elements, this is your game. As an upgrade to the 2017 Mystery Reels original, Red Tiger adds in the MegaWays formula with more fruit than ever before. If you don’t know about MegaWays, it’s a random reel modifier system that allows any given spin to produce a different number of symbols across the reels. What we like? It’s a big tribute to arcade fruit machine games with lucky 7s, horseshoes, bells and fruits on the reels. You can play from £0.20 to £10 a spin. Although a complicated reel set, it’s a simple game with lots of charm. A retro soundtrack fits the bill while clunky animation adds more homage to the 1980s fruity era. And about MegaWays, we can’t help but approve. Starting at 64 ways to win, Mystery Reels can pull off 117,649 pay lines! As for game features, it’s the pay table that’s got huge capacity, with payouts for up to 6 x symbols. There’s a symbol drop avalanche feature, mystery symbol and a free spins bonus wheel with added gamble option. You’ll start with 8 free spins, but you can gamble and win up to 20 free spins. And with retriggers available, did I mention multipliers. It’s all in here. How much can you win playing Mystery Reels MegaWays? Mystery Reels MegaWays is a high variance slot with a payout rate of 96.18% RTP. The highest symbol on the pay table is 6 x lucky 7s. This will win the 50 x stake jackpot whereas the games maximum win is 10,000 x your bet/spin. Bets start at £0.20 and go up to £10, let’s see how much you can win playing for real money at minimum and maximum stakes. At 20p a bet the lowest possible win combination is 3 x cherries paying out just £0.02. The 6 of a kind prizes are as follows: 6 x cherries = £0.16, 6 x lemons = £0.18, 6 x oranges = £0.20, 6 x plums = £0.20, 6 x grapes = £0.36, 6 x melons = £0.36, 6 x horseshoes = £0.40, 6 x bells = £0.40 and 6 x stars = £1.50. The Mystery Reels MegaWays jackpot of 50 x betting stake is £10 (6 x lucky red 7s) when playing with 20p. A maximum win of 10,000 x spin would be £2,000 at this level. Remember, while these single line wins seem small, the game features between 64 and 117,649 ways on each spin to clock them up! If you play maximum stakes (£10 a spin) then the lowest possible win is £1.00. 6 of a kind prizes return £8.00 for 6 x cherries, £9.00 for 6 lemons, £10.00 6 oranges, £10.00 6 plums, £18.00 6 grapes, £18.00 6 melons, £20.00 6 horeshoes, £20.00 6 bells and £75.00 for 6 stars. Playing at £10 a spin then the Mystery Ways MegaWays jackpot is £500 when lining up 6 x lucky red 7s. A game maximum win of 10,000 x stake is £100,000. Looking closer at the slots features, it’s all about the MegaWays random reel modifier system. This in itself gives Mystery Reels enormous identity. It’s an arcade-style 80’s throwback fruit machine to be reckoned with, and one worth playing. Ways to win is a constant surprise, covering a broad range of 64 – 117,649 possible win line combinations. Now that we’ve digested those crazy figures, let’s consider the features that will pack those ways to win. One, cascading reels mean winning combinations explode making room for further possible wins on the reels. Two, randomly triggered mystery symbol that clones itself to reveal a winning combination. Three, a free spins bonus round. 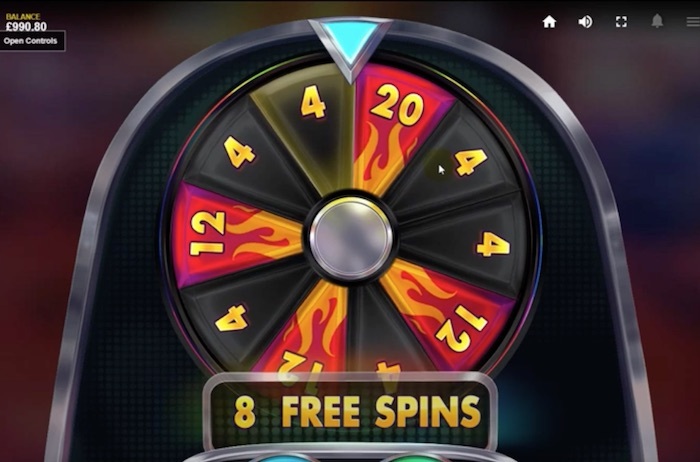 This has a built in bonus wheel and gamble feature, including possible unlimited free spins and multipliers. I’m not going to make this complicated and explain the whole MegaWays feature concept. But one feature happens after a win, another is random and the other requires 3 x bonus symbols to appear anywhere on the reels at the same time. Mystery Reels MegaWays is capable of generating some big wins thanks to a free spins bonus with endless opportunities. Another positive, if you gamble and lose your free spins by spinning the wheel, you’ll always get at least four freebies. 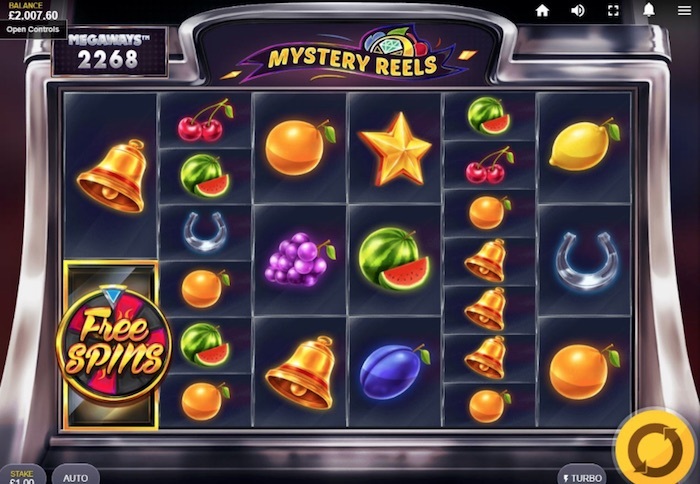 As far as online fruit machines go, Mystery Reels with MegaWays is one of the most able in terms of ways to win. 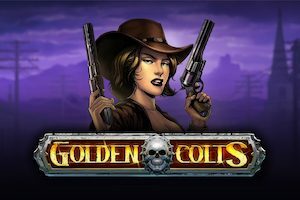 This is one of those new casino games you play for the free spins alone, a bonus with its own gamble wheel and one with unlimited potential. With its 80s pop soundtrack, familiar fruity symbols and random reel formations; Red Tiger blends the power of MegaWays with an old-school favourite. Our verdict, if you like retro games and arcade-era slots, this one has the modern upgrades that make £0.20 a bet potentially worthwhile.